Geckos Adventures tours are designed for 18 to 29 year old travellers. They keep their group sizes small and travel locally, including having awesome local guides lead all of their trips. Wherever you go with them, you’ll tread lightly and positively impact the communities you visit. 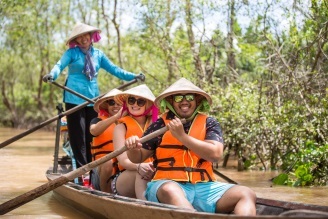 Geckos Adventures tours are designed for 18 to 29 year old travellers who want to have fun travel experiences with people their age, but don’t want to spend their trip on a huge tourist bus. You may be young, but that doesn’t mean you want to blow through 20 countries in a week. You’re looking to interact with locals, embrace new cultures and actually learn things (who were the Incas? Why was Angkor Wat built in the first place? ), while making friends and going to the coolest local bars, street food vendors and secret spots. Even more, each time you travel on one of their trips, you’ll positively impact the communities you visit. 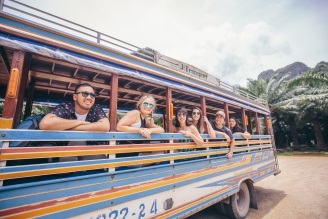 Their tours have small group sizes and travel locally to reduce their footprint while making sure you have an incredible grassroots adventure. Plus for every trip booked, they make a contribution to their social enterprise partner, Friends-International at no extra cost to you! Having a beer with a local, not at a pub for foreigners. Using trains, rickshaws and even camels for transport – never a big coach bus. Starting in 2017, they’re also partnering with social enterprise, Friends-International to support their vocational training programs, which provides skills training to marginalized youth in the regions they visit. A contribution will be made for every trip booked at no extra cost to the travellers. Geckos groups travel with an average of nine travelers and a maximum of 16. They find this keeps things more intimate, more relaxed, and less overwhelming for the small communities that sometimes host Geckos groups. 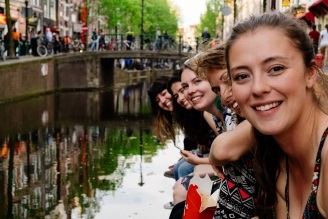 Traveling in small groups also gets people chatting and making new friends quickly, which is especially great for solo or first-time travelers. It’s hard not to bond with someone when you’ve eaten guinea pig, drunk corn beer and danced together at a Peruvian fiesta. Basically, if you’ve got an open mind, a sense of adventure and are willing to step outside your comfort zone, you’ll fit right in. Locals know best, it’s as simple as that. 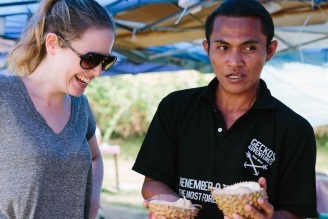 So all of Geckos Adventures leaders are local – and it’s as simple as that. Born and raised in the regions Geckos travel through, they’re the ultimate authorities on all things local, from traditional customs to tasty delicacies, language tips to historical tidbits. Need advice on trekking the Inca Trail? That’s Renaldi’s forte. Curious what that Hindu inscription says? Ask Arsaya. Geckos leaders aren’t just tour guides. They’re your new friends, lucky charms and walking, talking Wikipedias. Simply put, Geckos trips are cheap. Not in a ‘cutting corners’ kind of way, but in a ‘they won’t charge you for what you don’t want to do’ kind of way. Don’t want go zip-lining in Siem Reap? No problem – they don’t include it in the trip price. In the interests of keeping things both economical and adventurous, Geckos uses public transport and locally owned accommodation wherever possible. This could mean a homestay in Vietnam, a jungle lodge in Peru or trundling through Thailand in a tuk-tuk. You’ll never catch a Guatemalan chicken bus or an overnight train through India and emerge story-less and friend-free. It just doesn’t happen. Geckos Adventures travels in more than 50 countries across Asia, the Americas, Europe, Africa and the Middle East. That’s a lot of world to choose from. 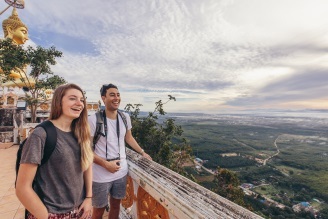 Like each destination they go to, their itineraries are one-of-a-kind, balancing the must-do highlights with tons of local encounters and visits to off-the-beaten-track locations. So while you’ll shop up a storm in the souqs of Marrakech, you’ll also meet Berber nomads tending to their sheep in the middle of rural Morocco. Geckos trips combine plenty of included and optional activities with loads of free time, so you’ll get to see what you want to see, when you want to see it. It’s your adventure, after all. The term does tend to get bandied about a fair bit these days, but Geckos Adventures truly believe in treading lightly. Employing local guides and staying in locally owned places means the money spent and skills employ stay in the communities Geckos visit. They also offset the main carbon emissions from their trips by investing in carbon credits. It’s only right. Basically, they see sustainable travel as traveling with a conscience. Or as someone wise probably once said: ‘he who runneth wild, acteth not like a jerk’. So then, how about it? Got an open mind? A sense of adventure? A craving to see the world for real? Run wild with Geckos. Ultimate in every way. Discover Cambodia’s temples, beaches, homestays, and markets galore. Roam through the lush Amazon jungle, sip on Pisco Sours, journey through the Inca Trail to Machu Picchu, and see Lake Titicaca. Snorkel, swim, sunbathe, repeat. Bask in beach bliss along South Thailand’s famous stretches of sand, paddle out to hidden lagoons on Koh Hong island, and stay up late to enjoy the famous Koh Samui nightlife. Watch the stars fill the night sky in the Sahara, see the sun rise over the dunes, and ride a camel through the desert. See essential Morocco in Casablanca, Fes, Marrakech, and more. Sleep in a lodge in the middle of the Amazon jungle, chill out by hot springs and waterfalls in Banos, and discover the colonial architecture, plazas, and churches in Quito’s Old Town. So much world, so little time.